Heat oven to 375°F. Spray 13X9-inch (3-quart) glass baking dish with cooking spray. In 5-quart Dutch oven, mix broccoli & cheese sauce, onion, cream cheese and pepper. Cover; cook over medium heat about 20 minutes, stirring halfway through cooking, until cream cheese and sauce chips are melted. Pour into baking dish. Separate dough into 12 breadsticks. 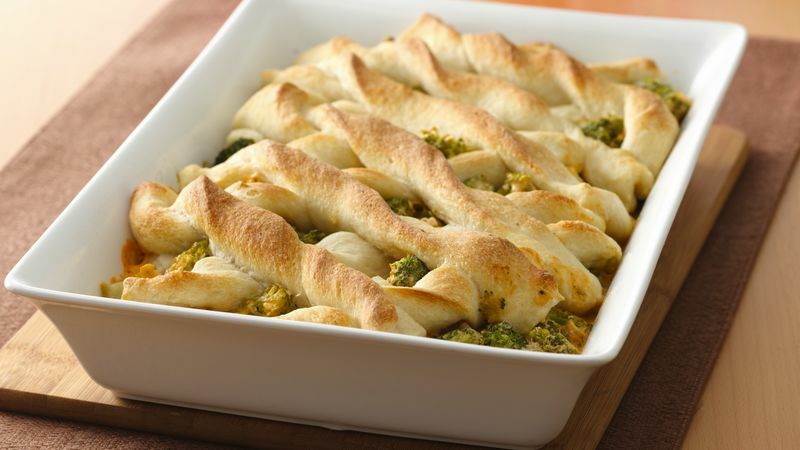 Arrange 6 breadsticks diagonally over filling. Arrange remaining 6 breadsticks diagonally in opposite direction. Fold overhanging dough into filling. Bake 20 to 25 minutes or until breadsticks are golden brown on top. Cool 15 minutes before serving.